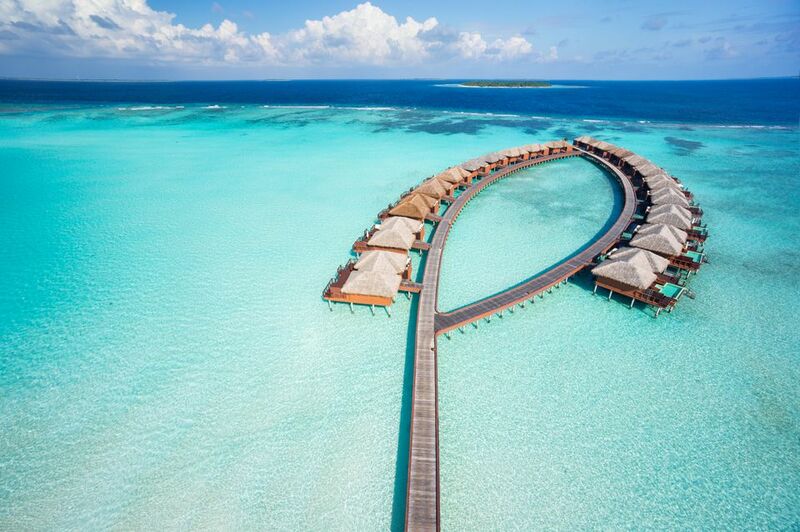 Are you thinking of spending your honeymoon or next getaway in an overwater bungalow? These unique standalone units are growing in popularity with couples. Find out why — and what other travel sites don't tell you about them. There are fewer than 200 resorts in the world with overwater bungalows, and many of them are located in distant destinations. Standalone units, they are more expensive to build than standard hotel rooms and most are not suitable for family travelers. Yet the panoramic views, the seclusion, and the direct access to water that they offer make them a seductive choice for couples. It's not just the settings that lure couples to these units. The majority are built for just two, with a king-size bed the only sleeping option (unless you count a hammock on the deck). And since a wayward toddler could easily slip into the water, it's safer for adults who can swim to choose this type of accommodation. Defining paradise, the Maldives consists of more than 1,000 coral islands in the Indian Ocean that are known for astoundingly white beaches, blue lagoons as warm and shallow as baths, and extensive underwater reefs. Yet there's no way to get there quickly from the United States: The flying distance to the Maldives from Los Angeles is about 10,000 miles. Overwater bungalows on the islands of Tahiti, Bora Bora and others in French Polynesia take advantage of the magnificent climate and setting. Tahiti is approximately 4,000 miles from Los Angeles. French Polynesian resorts with overwater bungalows that are popular with couples include the Four Seasons Resort Bora Bora, the St. Regis Bora Bora, the InterContinental Bora Bora and the Sofitel Bora Bora Marara Beach Resort. The Hilton Bora Bora Nui Resort was one of the first major overwater bungalow properties in French Polynesia, amazing couples with its floor window and easy access to the ocean. In 2017, it reopened as the luxurious Conrad Bora Bora Nui. It boasts an exclusive island located a short boat ride away, perfect for romantic dinners. Sandals Resorts — the adults-only all-inclusives located in the Caribbean — introduced the first overwater bungalows at its Sandals Royal Caribbean property on Montego Bay. They even have plunge pools on their decks. Sandals Grande St. Lucian and Sandals South Coast also feature these popular (and top-of-the-line) units. Luxe touches include butler service, a private outdoor soaking tub, an over-the-water hammock, extended sun deck, and an outdoor shower for two (but no plunge pool). Although Mexico has been slow to catch on to the craze for overwater bungalows, Karisma Resorts built palafitos at its adults-only El Dorado Maroma resort along Mexico's Riviera Maya, which faces the Caribbean Sea. Guests have exclusive access to an Overwater Ocean Grill & Wine Bar. South of Cancun, the ultra-luxe Rosewood Mayakoba also features overwater bungalows. However, these units overlook a mangrove lagoon rather than the Caribbean. Although the vast majority of overwater bungalows are overseas, there's one you can experience in the United States: Disney’s Polynesian Villas & Bungalows inside Disneyworld in Orlando, Florida, provides a Disneyized version of the tropics. The 20 units are minutes from the Magic Kingdom via water taxi or monorail. Since these large units sleep up to eight people, they're more accommodating to families than romantic couples. Yet having a private deck with a plunge pool may entice you to bring a few friends along. All-inclusive units are priced as high as $4,000 a night, although the majority are in the $1,000 range. Some also require a minimum number of nights to be spent in the unit. Upscale perks, including butlers, private airport transfers, premium sundries and white-glove-delivered liquors and afternoon canapés sweeten a stay. You'll have to search and travel far to find a budget-priced overwater bungalow; consider looking in Columbia, Panama, or Belize. One of the cheapest we found was the family-owned Oa Oa Lodge in Bora Bora. Each of the three units include a king-size bed, futon, refrigerator, desk, and deck overlooking the water. It'd great to have a private deck, but if your villa doesn't have a ladder down to the water, your overwater villa is incomplete. Most units stand from 3 to 7 feet above the water. Although you can dive in from your deck, you may have to find another way to exit the water (such as swimming to an adjacent beach). You may find your overwater villa too far from the action... or too exposed to the sun... or too far from the pool. At resorts such as Sandals Grande St. Lucian, guests have a wide choice of accommodations. Among them are Rondovals, which feature a private pool. If a resort is amenable, it's also possible to split a stay and spend a couple of nights in an overwater bungalow and a couple in a lower-priced unit. One of the big draws of overwater bungalows is that they feature a floor in the window so you can wash the underwater marine show. Depending on where your bungalow is located, the weather, and the tides, the view in the floor window may look less like a beautiful aquarium and more like the inside of a broken washing machine. Check out the presidential villa at Conrad Bora Bora, which has two of these spacious units with two levels. The overwater bungalows contain two bedrooms (bring a compatible couple!) and have an upstairs sunning deck and indoor sauna. Nobody expects their holiday to be a washout, but sometimes the weather gods fail you. Truth is, there's not a whole lot to do at an overwater bungalow resort when the skies open. To be on the safe side, throw an adult game into your suitcase. If you're spa lovers, you can kill time there. And there's always anticipating the next meal and drinking. Hôtel Palafitte's Lake Pavilions provide direct access to Lake Neuchâtel. The hotel also offers overwater dining in its Restaurant Terrace. There's no charge for guests to use a canoe, stand-up paddleboards, and fishing gear provided by the host. There's plenty of time for fun in the sun in the tropical locations where most overwater bungalows are located. But it can get very hot during the day, and fans don't help with humidity. Fortunately, newer and better hotels offer air-conditioning in their overwater units (always confirm). Then come inside, draw the curtains, crank up the a/c and take a refreshing midday nap (or check your email). Water conducts sound. Depending on how close your bungalow is to the next one and how vocal your neighbors are, it's possible you may hear your neighbors — and they could hear you. If you're really concerned about privacy, do a test with one of you inside the unit and the other outside nearby. These units are securely built on stilts driven into the sea bed. While you may hear the waves from your own bed, rest assured that your bungalow is securely anchored and let the gentle sounds lull you to sleep. Depending on the resort, you can ask them to arrange an intimate destination wedding ceremony in your overwater bungalow. Alternately, there may be a chapel nearby. If you book far enough in advance and desire so, you can buy out the entire resort so that your guests can be accommodated in your little slice of heaven.